Scientists in California state parks are using an unconventional strategy to save an endangered bird: food poisoning. Marbled murrelets are rare seabirds that nest only in old-growth redwood trees on the West Coast. 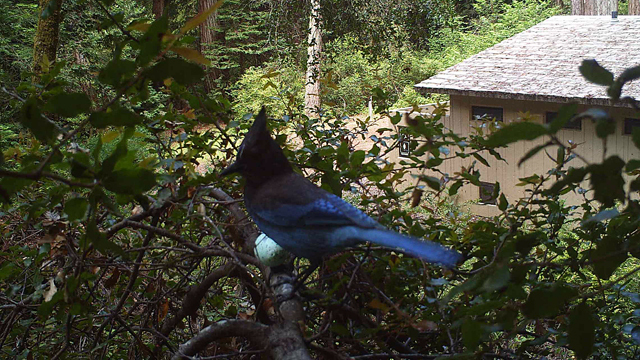 Their eggs are a favorite food item for another bird: Steller’s jays. In an effort to teach jays not to eat murrelet eggs, researchers are putting out “mimic eggs” containing an unpleasant surprise: a chemical that makes jays vomit. 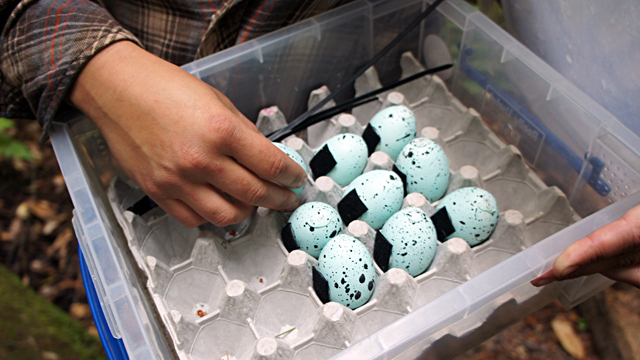 The decoy eggs are painted to look like a marbled murrelet egg. “They’re just chicken eggs,” says Portia Halbert, an environmental scientist with California State Parks. Hiking in a quiet redwood forest, Halbert spots one of the blue eggs with black spots on the ground in Butano State Park, about an hour south of San Francisco. She picks it up. “It was knocked off the tree likely by a bird,” she says. A small amount of the chemical Carbocal inside the egg is enough to give any jay tummy trouble. The idea is that jays will learn to avoid murrelet eggs, much like a person might stay away from a restaurant after getting food poisoning there. The creative approach came about because marbled murrelets are so challenging to save. They’re secretive, spending most of their time out at sea, diving for fish. Scientists didn’t know they nested in redwood trees until 1974. The birds usually lay just one egg a year. 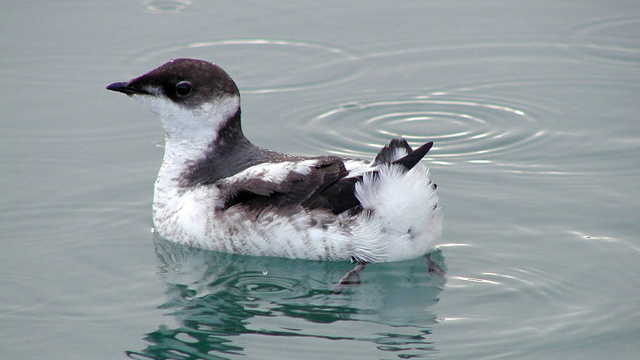 Murrelet populations have plummeted because much of their habitat has disappeared. Ninety-five percent of California’s old-growth redwood forests have been logged. At the same time, Steller’s jay populations have boomed in state parks, thanks to the crumbs left behind in picnic areas. “You’ve got people on the edge of the park with backyard bird feeders and then you also have increased availability of food from park visitors,” Halbert says. 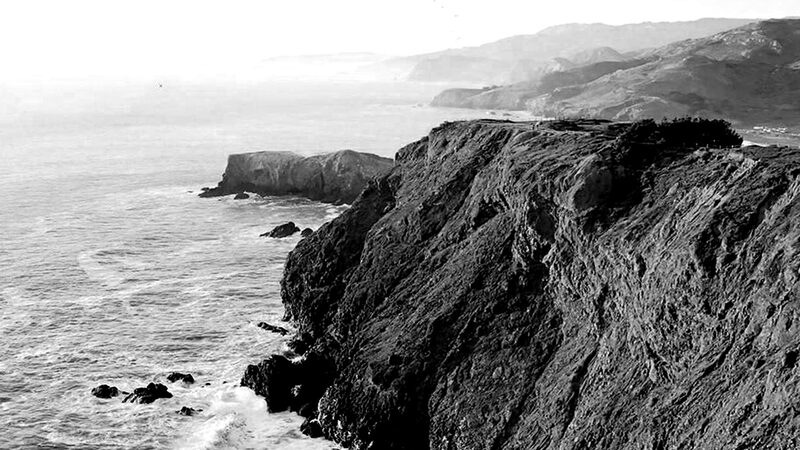 California State Parks has set up a new program to control trash from visitors. The experimental decoy eggs are also looking promising. In a controlled lab study at Humboldt State University done by Pia Gabriel and Richard Golightly, the jays seemed to alter their behavior. Halbert’s field team is putting out 1,400 fake eggs this spring and summer in three parks. It’s the third year of the project. But the danger of outwitting a jay is that the bird can outwit you back. “Ravens, crows, jays – they’re really, really smart,” says Elena West, a researcher at the University of Wisconsin-Madison. 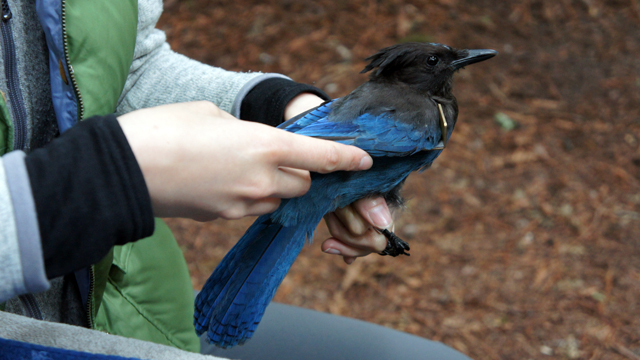 She and fellow researcher Harrison Jones have captured a blue and black Steller’s jay at a campsite in Butano State Park. They’re studying hundreds of jays in the area in an effort to learn how their behavior changes around people. Working with the Einsteins of the bird world is a doubled-edged sword, West says. The jays are fast learners and may actually remember that murrelet eggs taste bad. But real murrelet nests are hundreds of feet up a redwood tree, higher than the decoy eggs are being placed. The jays might figure out they only need to avoid the eggs down low. To really help murrelets, the behavior change may have to come from people. West's blood and feather samples show the jays rely on human food for up to half of their diet, especially during the summer camping season. Researcher Harrison Jones says the birds actually stake out territories near the busiest campsites. “They’ll come down and do a song and dance for campers when they arrive at the campgrounds to try to get them to feed them,” says Jones. Concerns over the decline of murrelets prompted the Center for Biological Diversity, a non-profit advocacy group, to file a lawsuit last year against California State Parks, saying the agency wasn't doing enough to protect the endangered birds. “Most visitors to the park would be very upset to know that their trash was pushing these birds, these amazing seabirds closer to extinction,” says the Center's Shaye Wolf. Wolf’s group wanted to see campgrounds in several state parks moved out of redwood forests. “The camping in those parks is concentrated in the heart of the best nesting habitat for murrelets and this is a highly endangered population,” Wolf says. For now, the lawsuit settlement requires a trash control program be put in place. It includes new sealed trash cans and a “Keep It Crumb Clean” public education campaign. California State Parks is hoping that trash control, along with the stomach-turning decoy eggs, will be enough to do the job.